You understand why your favourite tea mug is the one with the chip in the rim. Or how you just can’t throw away those old slippers with holes in the toes. You know how a slight shabbiness can be agreeable. You understand the way a certain dog-eared quality can be comforting. Perfection, somehow, is just not our thing: a little roughness round the edges is needed before we can connect. Maybe one of your favourite bits on a record is where the singer’s voice catches or wavers slightly, in a way they can’t reproduce but just happened in the studio at this serendipitous moment which raises your neck hairs every time. And we all prefer the wayward genius of the late Alex Higgins and George Best to a Stephen Hendry or an Alan Shearer. You quite clearly understand all this very well. If you didn’t, you wouldn’t put up with the ropey template I’m still using for this website. And you wouldn’t be on this website at all, regardless of its design. Because if your soul didn’t rebel against Ikea perfection now and again by crying out for a threadbare sofa, then you wouldn’t really understand pubs. The Wenlock Arms in Shoreditch, London embodies this paradox perfectly. Or imperfectly, since perfection is such a turn-off. The ceiling can’t have been painted since long before the smoking ban. The flooring surfaces around the entrance are haphazard. There are scratches in the wooden panelling, and the walls are a jumble of pictures, notices and posters with a flag and a World Cup wallchart thrown in to boot. There are two people working the bar, and one of them sounds really quite dotty. Her terrific and startling cackle punctuates the stop-start badinage of two men at the bar. One is a stringy old Geordie, the other shrouded in one of those enormous beards worn by South African white supremacists with firearms collections that take up most of their farm. They all sound like interesting folks, though, with stories to tell. On another day it might have been a splendid thing to chat. 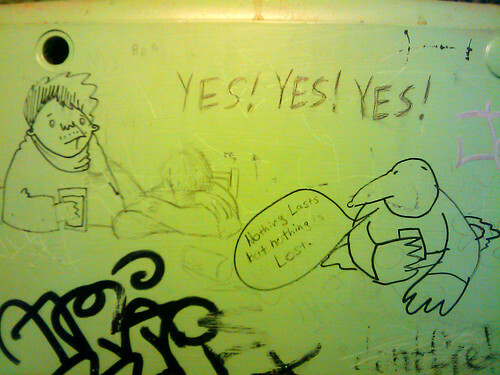 Even by London’s high standards, the toilet graffiti is interesting, a mournful but compelling cartoon on the cistern top. I wonder how long it took the artist, and how they managed to go undisturbed the whole time. Then again, there’s hardly anyone in. Any prospective graffiti artist would get a clear run at a Sistine Chapel today. Other than the men at the bar, on the next table to Marianthi and me, a solitary bald man is setting about a sausage sandwich. But it’s the handpumps along the bar, signifying half a dozen cask-conditioned ales, that have got me salivating like a Pavlov dog. Some ring a bell, some I know well, some I’ve never heard of. With less than an hour to pass in here before the intervention of train timetables, I drink three halves. Oh, they’re fine, fine halves. And I’ve never appreciated the southern mania for beer without any head. But even I have to appreciate the perfect craftswomanship with which the staff here erase every last trace of froth from the top of the pint. You get the impression sometimes, with London pubs of this type, that for all their effortless character and charm, they can’t really have much of a community about them. Or at least not in a fairly central district like this. That there might be one or two regulars, in a habit of decades, and the rest of the clientele is just passing through. Lunchtime drinkers. Real ale tourists, like me. Actual tourists, maybe. 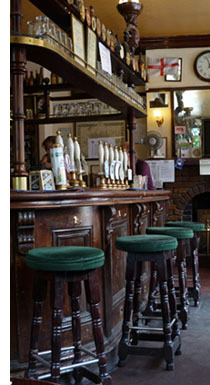 The Wenlock Arms website, though, suggests a place that people call home. They’ve got football and cricket teams. They have live jazz, and a folk festival. There’s a page with pictures of the drinkers’ dogs. It’s lovely. And I’m not just saying that because it looks like the man with the beard might be the webmaster and I’m hoping that if he reads this he doesn’t get offended by what I said about his beard. Back at the bar they’re talking about funerals. The apparently dotty barwoman sings a line about funerals. I don’t know if it’s a real song or she just likes setting conversations to music as she goes along. Either way, it doesn’t matter. These aren’t the beautiful people of Hoxton. It’s way better than that. The Wenlock Arms is a fascinating pub with scuffs in the floor and bats in the belfry, and all the better for it. Here’s the sting: it’s apparently under threat of closure. In the meantime it’s a near-perfect pub in a far from perfect world. That was worth the wait, Pete. Best piece I’ve ever read about any pub ever. 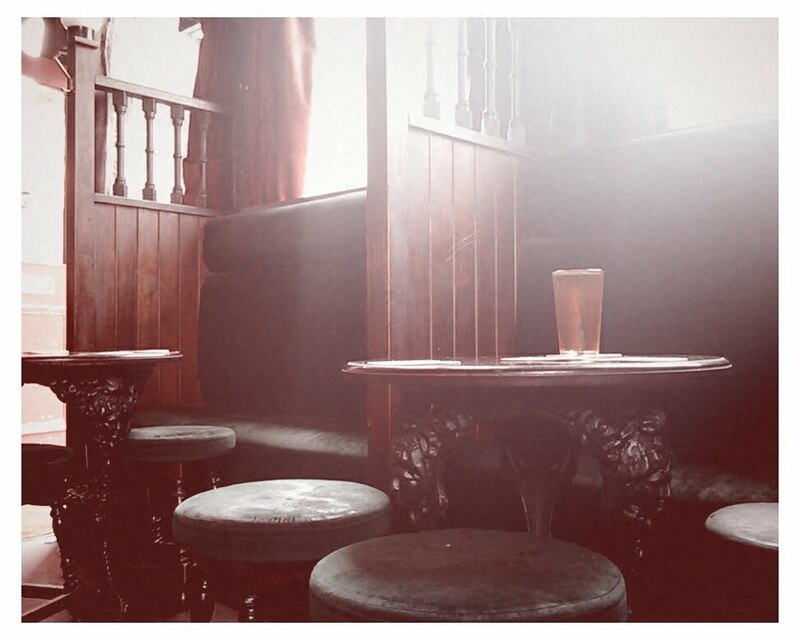 Aside from fulfilling my dream of going for a drink before going into work, our morning in the Wenlock Arms reminded me just how lovely it is to sit quietly in a quiet pub. It’s almost impossible to do that in London, unless you skive off work. Something I’ve tried to do ever since. Thanks for eloquently describing this fine institution, hope you persuade more ale lovers make the trek to find it. But do you have any more news on the closure threat? last i heard the landlord has had enough and wants to sell up, rather than eg it being knocked down or anything. Looks like it’s closing next month. Great blog and a great idea for a blog, Pete. I visited the Wenlock a few years ago, on a couple of consecutive nights, whilst stopping with a mate who lived round the corner. I remember there was an ace cafe nearby too (Magpie, Gypsy…summat like?). It is easily in my top five pubs in That London, and it was absolutely buzzing, not least when it filled with Arsenal fans who’d just thrashed my team 5-1 (Leeds). A glorious pub in the best tradition, and sad it may be doomed, (although it’s so fondly known I expect someone will take it on). Thanks for sharing, Brian. Memories like these make it all the sadder to lose a pub. This was always my favourite pub when I lived in London. I came here every friday night to watch the jazz band and have a few beers.